Australia, New Zealand and France have dominated the opening day of racing here at the ISA Worlds in Fiji, taking the most points as four gold medals were awarded and defending champions Team USA stumbled in the small, windy and tricky conditions at Cloudbreak. The Aussies swept the prone races before Kiwi Penelope Armstrong (née Strickland) struck gold by outlasting Frenchwoman Olivia Piana (silver) and upsetting title holder Candice Appleby (bronze) around a 3km course that looked less like a technical race and more like a downwinder. 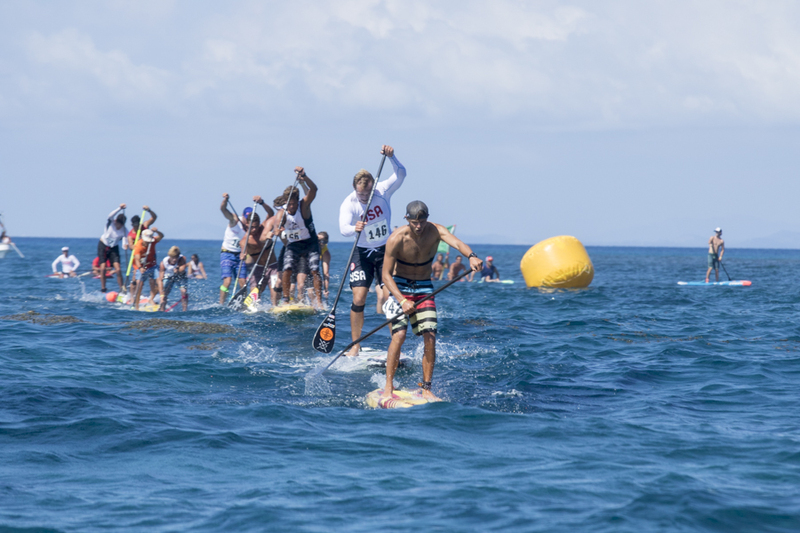 Moments later, Casper Steinfath scored a rare wave down the point on the last lap of the intense, closely-fought men’s final to out-maneuver Kai Lenny, Arthur Arutkin and Titouan Puyo and claim his third ISA title. 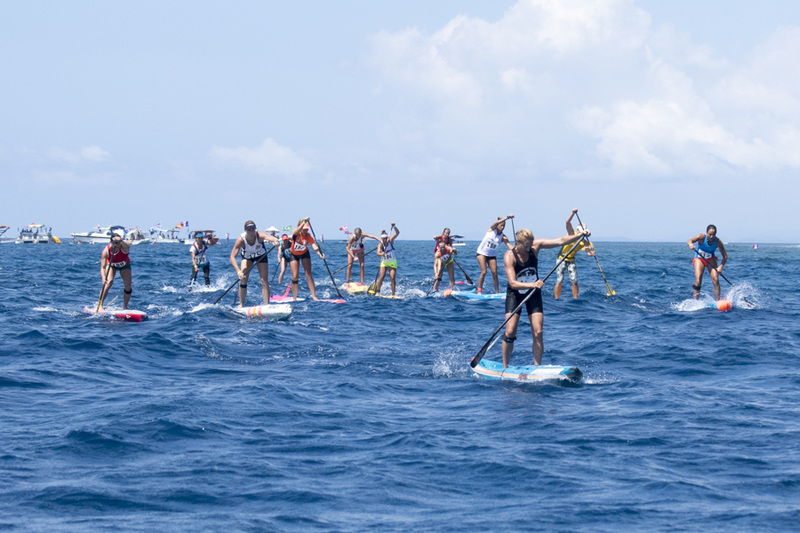 The morning started on a slow note, with the athlete mothership arriving late and a cautious course layout meaning the early heats avoided the surf and became a slow-paced, flat water affair. The men’s prone and women’s SUP semi-finals were more of a warm-up than a test for the top contenders, however the 4x men’s SUP qualifying heats were hard fought. The unpredictable nature of the seeding, the cut-throat elimination format (less than half the field progressed) and top talent in the field meant some of the big names missed a spot in the final, including Tahiti’s Georges Cronsteadt and Brazil’s Vinni Martins. But after a fairly prudent course in the morning, race officials moved the course slightly closer in to the break, which added a bit of spice to finals as the waves occasionally came into play. First up it was the women’s prone finale, with Australia’s Harriett Brown showing just how deep the traditional paddleboarding pool of talent runs in Australia in carrying on Jordan Mercer’s four-year winning streak and claiming the first gold medal of the event ahead of New Zealand, France and Spain. Adding to her win is the fact that Harriett was in bed all day Tuesday feeling sick, and still wasn’t at 100% on Wednesday morning as she lined up for the race. The Aussies went two from two in the very next race, with Molokai regular Matt Poole paddling clear to win from team mate Lachie Lansdown and New Zealand’s Nick Malcolm. American Jack Bark held onto the copper medal position (4th), giving the defending team champions one of just two medals for the day. The Stars & Stripes would claim that second medal moments later, however it probably wasn’t the colour they were expecting; Candice Appleby was the defending champ and firm favourite in this race, but with a strong wind picking up after lunch and a lack of waves on offer, this was less of the surf racing format that Candice is famous for dominating and more of an upwind/sidewind/downwind slog fest. Slogging it out the best was the supremely impressive Penelope Armstrong, who raced beautifully and maximised every bump on offer with her Starboard Ace to hold the lead from first buoy to last. Pea, a two-time Molokai podium-finisher, won a medal in this race last year but was highly under-rated (at least by some) heading into this year’s event. 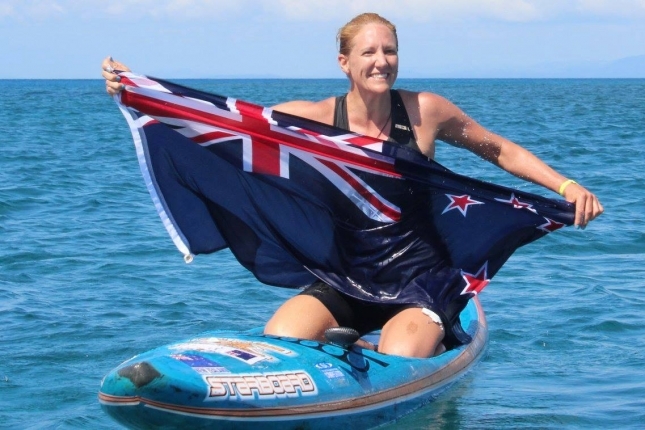 She only came into the national team after world number one Annabel Anderson withdrew a few weeks ago, but the veteran proved more than worthy as a replacement by giving New Zealand its first ever gold medal at the ISA Worlds. This is no doubt the biggest win of Penelope’s career, and shows that there’s no substitution for hard work and determination. The New Zealand boat went wild as Pea crossed the line, and the athlete herself was clearly stoked on the victory. Pea is best described as a ‘journeywoman’ paddler who often flies under the radar and doesn’t get the credit her incredible raw talent deserves. That’ll all change now though, and she’ll probably have a target on her back the next time she stands on the start line (and will probably get a bit more credit in predictions). Almost equally impressive was France’s Olivia Piana, who stayed within shouting distance of her Starboard team mate the whole way and looked very strong around the entire course. I picked Olivia as a better chance in the distance race, however she continued her excellent season and cemented her place in the top tier of the sport with another fine course race performance today, backing up the 4th place finish she scored at last month’s Pacific Paddle Games surf race in California. Settling for the minor medals were the two women I’d picked for the top two spots: Candice (bronze; 3rd) and Aussie Karla Gilbert (copper; 4th). Candice fought hard but clearly wasn’t enjoying the washing-machine like conditions, while Karla threatened early before losing touch with the leaders late. Canada’s Lina Augaitis, still on the return path after giving birth to her first child 10 months ago, was within striking distance of a medal for Team Canada but could never quite close the gap. Laura Quetglas fought hard all the way to earn Team Spain valuable points, while Tarryn King was impressive for Team South Africa but probably wished there were more waves on offer. I took a pause halfway through proceedings to go diving on the beautiful reef, while just looking around at all the team flags flying on the support boats was an inspiring sight. Fiji truly is a paradise, and while they have a lot of flaws to iron out, we must thank the ISA for bringing us to this slice of paradise in the South Pacific. The ISA didn’t really deliver on the hype of racing at Cloudbreak but it was still a fun day out there. It was also really cool to see the camaraderie between the teams on the assembled boats, which is what this event is all about. It often seemed like the racing was secondary to the floating festival atmosphere. Things definitely went up a level in the finals though, with the athletes showing they were the real stars of the event by giving us some genuine entertainment. Sure enough the headline event, the men’s SUP race, was the most exciting of all, with a solid field of international names battling all the way from start to finish in a see-sawing showdown that left the flotilla of ships cheering in the hot afternoon sun. With all-star names from France, Australia, Hawaii, Denmark and the USA on the start line, this was always going to be the most hard-fought event of the day and it certainly lived up to the hype. Slater Trout and Casper went out hard off the line, leading from the opening horn til the halfway point of the final lap, with the likes of Arthur Arutkin, Kai Lenny, Toby Cracknell, Titouan Puyo, Lincoln Dews and under-rated Kiwi Marcus Hansen from Team NSP all giving chase. The lead changed several times throughout the race, with Arthur taking the lead and looking impressive before falling at a critical buoy turn to lose valuable ground. The Frenchman fought back hard though, regaining touch with the leaders within half a lap as his team mate Titou struggled despite the race offering the bumps he so loves. The Aussie duo of Lincoln and Toby had a rollercoaster race, sitting in the virtual medal positions at times before fading late to finish outside the podium. Captain America (Slater) was perhaps the unluckiest competitor, or perhaps the race was simply half a lap too long for him. After sitting in the top two spots for almost the entire race, Slater was passed by a handful of rivals in the final 500 metres that saw him bumped out of the medal zone. Kai Lenny looked strong all race, showing no signs of the insanely-demanding schedule he’s endured the past two weeks, where he’s competed on the Big Wave World Tour, the Windsurf World Tour and traveled to Fiji last minute to compete for Team Hawaii. Titou finally found his rhythm in the closing stages, powering home to move from 8th up into the medal positions within the space of a minute. But in the end nobody could match The Viking, with Casper stealing a rare set wave on the final lap to surf clear and paddle home to a heroic, well-deserved gold medal. 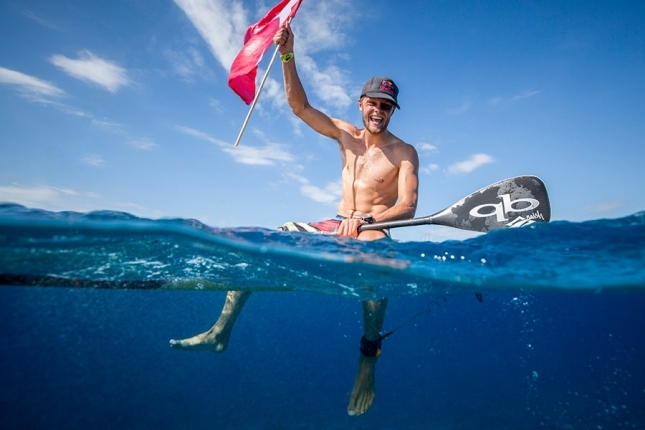 This is Casper’s third ISA title after he won the same event in 2013 and 2014. “The wave of my life” was how he described that winning ride in the moments after the race, which says a lot about how much this event means to Casper considering that ‘wave’ was a sloppy, one foot dribbler that he wouldn’t have looked twice at if he was freesurfing, but which ultimately proved pivotal in this tight title tussle. The result also cements Casper’s reputation as one of the world’s ultimate short course racers, with this victory adding to his 2016 sprint race wins in Japan, Germany and Maui. It looked like Team France was going to secure a silver-bronze finish, however Kai put in a superhuman sprint over the final 50 metres to reel in both Titou and Arthur at the death. That not only gave Team Hawaii some valuable points, it gave me some valuable pride after I totally butchered my Fiji predictions in the women’s final. So anyway that was the ‘surf’ race here in Fiji today. Photos over on the official site. The live webcast returns at 8am Thursday (Fiji time) with the marathon race for men. Check out my predictions for a quick ‘Fiji Form Guide’ and then follow the action as it happens tomorrow.